Found this interesting article on the BBC website. ‘Surveys reveal that people with disabilities consistently report a good quality of life, says Tom Shakespeare. So why is it often assumed they are unhappy? Have you ever thought to yourself: “I’d rather be dead than disabled?” It’s not an unusual reflection. Disability, in everyday thought, is associated with failure, with dependency and with not being able to do things. We feel sorry for disabled people, because we imagine it must be miserable to be disabled. But in fact we’re wrong. It’s sometimes called the “disability paradox”. Surveys reveal people with disabilities consistently report a quality of life as good as, or sometimes even better than, that of non-disabled people. Impairment usually makes little difference to quality of life. Research shows, for example, that overall levels of life satisfaction for people with spinal cord injury are not affected by their physical ability. Even the clinical facts of whether their spinal lesion is high or low, complete or incomplete – all aspects that affect functioning – don’t seem to make much difference. Human flourishing is possible even if you lack a major sense, like sight, or you can’t walk, or you’re totally physically dependent on others. So what’s going on? If you think about it for a moment, you realise that people born with an impairment have nothing to which they can compare their current existence. Someone lacking hearing or sight has never experienced music or birdsong, visual art or a sublime landscape. Someone with an intellectual disability may not consider themselves different at all. Someone like me, born with restricted growth, has always been that way. Even if life is sometimes hard, we are used to being the way we are. For people who become disabled, there’s a typical trajectory. I can say this from personal experience, having become paralysed in 2008. Immediately after the onset of injury or disease, one can feel profoundly depressed, and even contemplate suicide. Maybe you are sceptical about the subjective nature of quality-of-life data. Bioethicists sometimes describe these self-reports in terms of the “happy slave” concept, in other words, people think they are happy because they do not know any better. Perhaps these cheerful people with disabilities are deluding themselves. Or, perhaps they are fooling others. Maybe in private they admit to misery, while in public they put on a brave face. Either way, it’s said these folk must be in some kind of denial. But these explanations are patronising, not to say insulting. More importantly, they’re wrong. 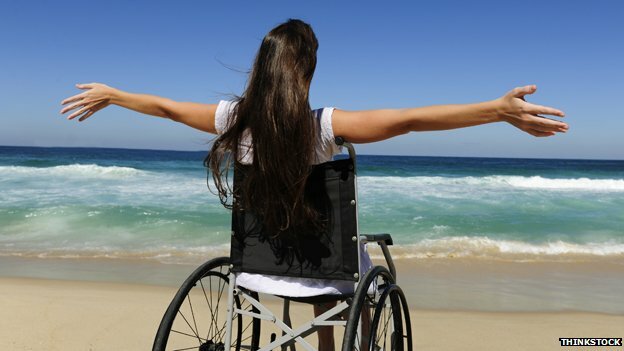 Research in a field called hedonic psychology has supported disabled people’s self-reports of good quality of life. Scientists such as Daniel Gilbert have done very thorough testing of what people say and how they think. They’ve come up with the concept of hedonic adaptation – which refers to the way in which after trauma, quality of life eventually returns to approximately what it was before the trauma struck. Amazing, eh? Unfortunately this also happens in reverse – so, if you are lucky enough to win the lottery, you’ll feel like £10m for a year or two, but then you’ll go back to being as miserable or cheerful as you were before your stroke of luck. So if these self-reports are true, we will need to find better ways of understanding the disability paradox. To start with, we can offer more nuanced accounts of the psychological processes that go on in the mind of a person with disability. Adaptation means finding another way to do something. For example, the paralysed person might wheel, rather than walk, to, places. Coping is when people gradually re-define their expectations about functioning. They decide that a stroll of half a mile is fine, whereas previously they would only have been content with a 10-mile ramble. Accommodation is when someone learns to value other things – they decide that rather than going for walks in the country with friends, it’s far more important to be able to go to great restaurants with them. This teaches us an important lesson – human beings are capable of adapting to almost any situation, finding satisfaction in the smaller things they can achieve, and deriving happiness from their relationships with family and friends, even in the absence of other triumphs. Our appraisal of life with impairment may have less to do with reality than with fear and ignorance and prejudice. We wrongly assume that difficulties for people result in misery for people. Even to the extent that impairments do entail suffering and limitation, other factors in life can more than compensate for them. Take the recent French box office sensation Les Intouchables, in which the protagonist, Philippe has tetraplegia, but despite this, he is able to have a good quality of life because he has money. Even people who aren’t lucky enough to be wealthy Parisian aristocrats can enjoy the benefits of friendship or culture, despite the restrictions that impairment places on them. By contrast, it is plain to see that someone can have a fully functioning body or mind and yet lack the social networks or the personality necessary for living a happy and fulfilled existence. This highlights the importance of the environment in determining the happiness of disabled people. As in most areas of life, it’s structural factors that make the real difference. Participation, not impairment is key. Do access barriers stop you going to school with your friends? Do you have a job? Does society meet the extra costs of having an impairment through a welfare system which is fair and non-stigmatising? Do you face hostility and hate crime? Unfortunately, in most of these respects the situation for disabled people has been getting worse, not better, in recent years. According to the Centre for Welfare Reform, this government’s spending cuts have had a hugely disproportionate impact on the lives of disabled people in poverty. In arguing that social barriers are more of a problem than the impairment itself, I am not suggesting that fear is completely irrational. For a start, disability is very diverse in ways that mean we have to soften the claim that “disability is no tragedy”. Some illnesses and impairments undoubtedly involve greater degrees of misery or suffering than the average human should have to endure. I’m thinking of depression, for example, which biologist Lewis Wolpert memorably labelled “malignant sadness”. There are some nasty and painful degenerative diseases. Impairments that involve considerable pain, whether physical or mental, are obviously less compatible with a good quality of life. It’s also true that in general, disabled people usually have fewer choices than non-disabled people. Most societies still have limited accessibility. Even in a barrier-free world, the disabled person is more likely to rely on mechanical devices that periodically malfunction, rendering the individual excluded or dependent. I have been stranded thanks to a flat tyre on my wheelchair or a broken lift numerous times. Most disabled people become inured to the frustrations of inaccessibility or breakdown, but it certainly makes life less predictable and less free than it is for the non-disabled. But my point is that while disability is not simply an irrelevant difference, like the colour of your skin, neither need it be a tragedy. And remember: Mere existence entails problems. Hamlet, listing reasons why death is to be preferred, highlights “the thousand natural shocks that flesh is heir to”. To be born is to be vulnerable, to fall prey to disease and suffering, and ultimately to die.